Okay, now why would I post about the lowly tuna melt? Everyone probably has their own twist and probably has been making theirs the same way since forever. Me, I only started eating tuna after 10 years of being a vegetarian. I’m kind of a tuna-newbie, but I’ve taken to it like honey. It was actually an old boyfriend who turned me onto tuna melts. We broke up but the tuna melt remains my constant lunch time/lazy dinner time/snack time stand by. I love the tang of the pickles, I love the melty cheese and I like that I can eat it out of one hand, so it’s the perfect working on the computer and eating lunch at the same time kind of meal. I love me my tuna melt! Now there is nothing fancy here and while I have been known to doctor up the melt with capers, red onions, parmesan and fresh dill on occassion, I like to keep things simple. Onion for flavour, celery for crunch, and definitely, definitely, pickles. The amount of mayo is really up to you, but I like to keep things light. My choice of bread is always a pita, but I know Cornelius favours a Portugese roll. The recipe below uses things like tablespoons and teaspoons, but I just eyeball it. Below is just my best guess, so taste and adjust to whatever suits you best. If you don’t want to go through the trouble of making a melt, just eat it inbetween 2 slices of bread and call it a sandwich. It’s good that way too. Preheat oven to 400. In your cutest vintage pyrex bowl (I like my teal butterprint bowl), mix up the above ingredients. Spread the mixture over the 2 pita breads and then sprinkle some extra cheese over top so it can get all melty. Place on cookie sheet and bake until cheese is melty and golden, about 10 minutes. I like to zap it under the broiler so the tops get extra golden – but watch out, it burns easily! Now I know what I’m making for supper!!!! Yum yum. mmmm, your version sounds delish – I’d have to make for myself or delete the celery for the husband to eat. (what’s up with celery hate?) Below is my version. OMGOSH never thought of putting pickle in it! I’m soooo making this for myself tomorrow! i have no idea who would hate celery, anon! a slice of cranberry sauce? weird! tho, i do put blobs of cranberry sauce on just about anything! jenn, pickles make it rock. seriously. Beth – Being from a Meditteranean family myself – it is unheard of to combine fish with cheese…for some reason it is considered “in bad taste” at the table to unite fish and cheese together…and I’m not even Jewish! It’s really interesting how various cultures/families develop rules around food. I had to introduce Liam to the tuna melt. He grew up in the Northern Boonies and his family had weird ideas about food (although you would have thought that tuna melts would be one of the few things he would be familar with). Maybe it’s cause the fish comes out of a can instead of out of the Lake? I’m not really sure. He’s very familiar with smoked fish however. Suffice to say, he was missing out, and tuna melts are one of his favourites now. It may seem weird, but cheese and fish is a classic British combo. Like cod in mornay sauce. Or potted shrimp. Or fish pie. I am cleaning out my kitchen before we move and in a fit of expermentation and pre-move stress I actually combined some leftover fillets with some frozen peas and some whole-wheat mac and cheese we desperately needed to get rid of. I know it sounds horrifying, but it was surprising delicious. joanne, hope your tea party goes well & let me know what you whipped up! nicole, i’ve never tried olives, but that sounds lovely. beth, i didn’t grow up with them either but i think it’s because my parents had an aversion to melted cheese! Hi! I made the vegan coconut cupcakes (your recipe) which were simply divine…you couldn’t tell that there were no eggs in the cupcakes…moist and very yummy. I also make the 6-minute chocolate cake “Wacky cake”(linked over to the recipe from your blog) and whipped up some the “World’s Best PB Fudge Sauce”(your recipe – but skipped the added peanut butter) I used it as a side to drizzle over the cake…Devilishly decadent and so so very chocolatey. I also made some sugared almonds and flavoured them with the contents of two teabags…pretty awesome and addictive. Finally, I also served a Dutch apple pie purchased from the St. Jacobs farmer’s market. And some organic strawberries that went very nicely with the chocolate sauce. And tea…lots of various teas! I think that I outdid myself and my guests were pleasantly surprised at my baking skills…They also went home with the leftover desserts. Thanks Kickpleat, for your inspiring recipes!! I never thought of a pita before. 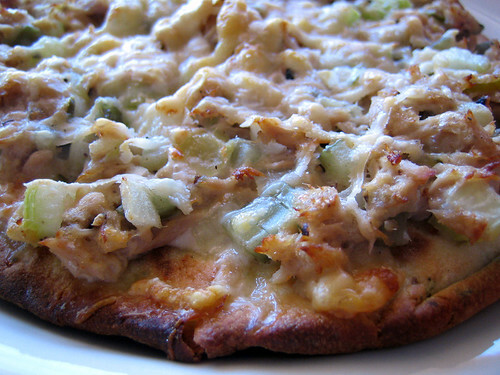 It’s like a tuna melt pizza! And perfect timing, too–I was wondering what I was going to do about lunch today! Thanks for posting this. I just made the best tuna melt ever! 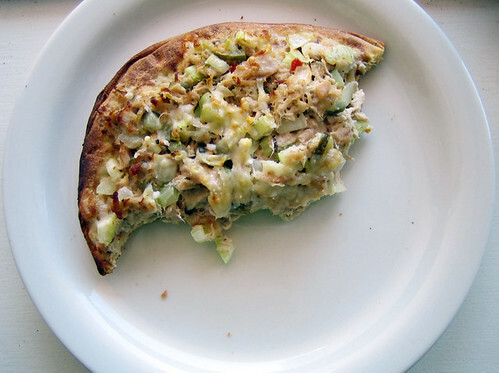 The tuna to cheese crust ratio was always wrong until today. Spreading it out on the pita is definitely the way to go. The cheese was golden brown and the mayo in the tuna salad puffed up just a bit. It was wonderful. This will definitely be a winter lunch staple. joanne, your tea party sounds divine! laura k, pita is definitely the way to go! 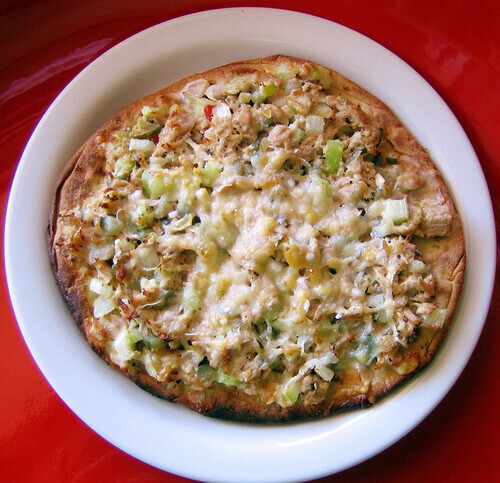 yes, very much like a tuna pizza!